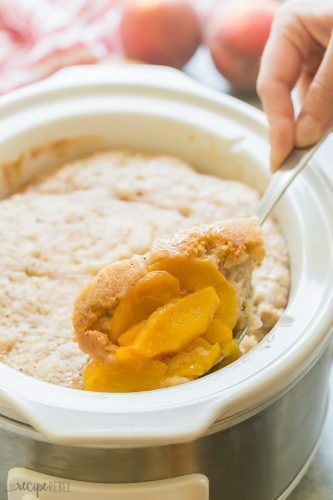 This Crock Pot Peach Cobbler is an easy dessert, perfect for those fresh summer peaches! With a sweet biscuit topping and thick, syrupy peach filling underneath. 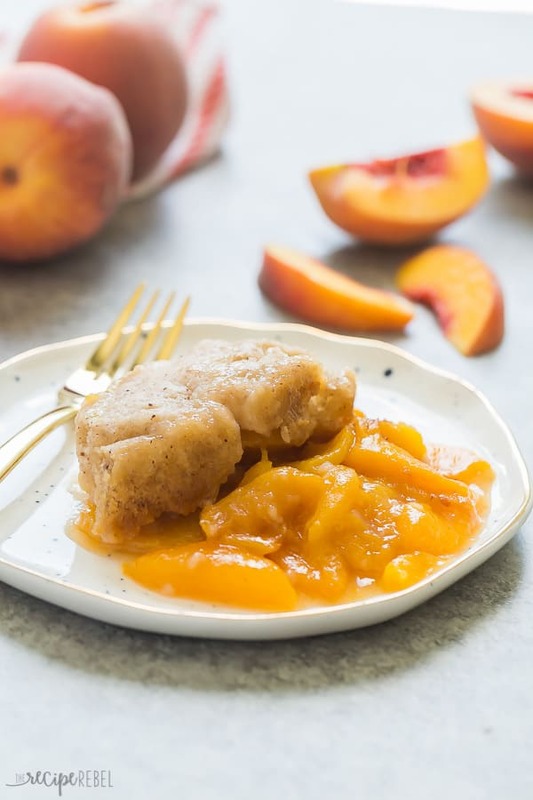 It’s Ashley from The Recipe Rebel and I’m back with one of my favorite ways to use up those fresh peaches (if there are any left over once the kids find them!). 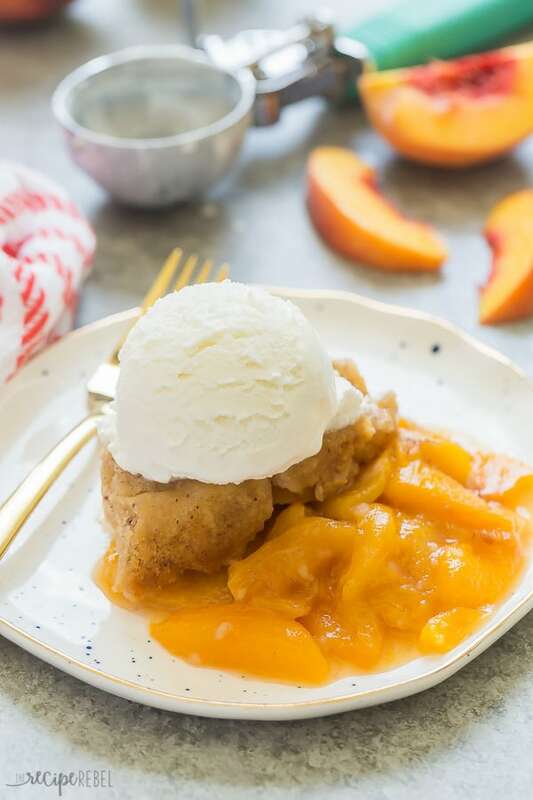 This Crock Pot Peach Cobbler is so easy to make and it keeps the house a lot cooler as it cooks — no oven required! I love that you can use any fruit you have on hand, and if you don’t have any fresh fruit you can easily swap it out for canned peaches or frozen (be sure to see the notes below). A fresh, hot fruit dessert with vanilla ice cream is one of my all-time favorite desserts, any time of the year. Whether it’s a pudding cake, this cherry cobbler, rhubarb crisp, or pretty much any other — I have to hold myself back from diving right in. The way the ice cream melts over the top gets me every time! To use canned peaches: drain the juice from the can and continue with the recipe as written. To use frozen peaches: you can add the peaches right from frozen, just be sure to add one more tablespoon of corn starch if you like it a little juicy and two more tablespoons if you like a thicker filling. I recommend a shallow, casserole-style crock pot for this recipe but really any will do, as long as it is 2.5-4 quarts in size. Keep in mind that a deeper or larger crockpot may take a little extra time to cook because of the depth of the cobbler. In a shallow, casserole style crock pot, it heats up more quickly. Feel free to mix up the fruit or add in as you have — raspberries would be amazing in this, as would slice strawberries or blueberries. Lightly grease a 2.5-4 quart crock pot. Place peaches, ¼ cup sugar and corn starch in the crock pot and stir until coated. 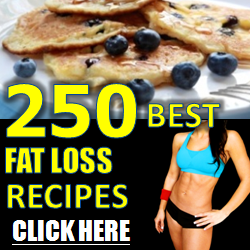 In a medium bowl, stir together the flour, ½ cup sugar, baking powder, cinnamon, and salt. Cut in the butter with a fork or pastry cutter until pea-sized pieces remain. Add the vanilla and buttermilk gradually, stirring until a soft dough forms. Drop by heaping tablespoonfuls over the peaches. Cover and cook on high for 2-3 hours or on low for 4-5 hours. Serve warm with ice cream as desired.